This study, using 13C nuclear magnetic resonance spectroscopy showed enrichment of glycogen carbon (C1) from 13C-labelled (C1) glucose indicating a direct pathway for glycogen synthesis from glucose in rainbow trout (Oncorhynchus mykiss) hepatocytes. 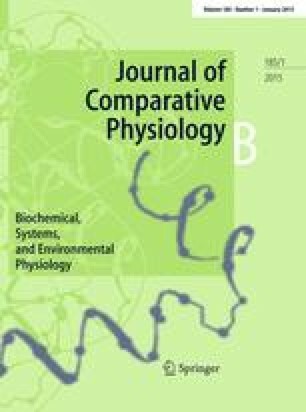 There was a direct relationship between hepatocyte glycogen content and total glycogen synthase, total glycogen phosphorylase and glycogen phosphorylase a activities, whereas the relationship was inverse between glycogen content and % glycogen synthase a and glycogen synthase a/glycogen phosphorylase a ratio. Incubation of hepatocytes with glucose (3 or 10 mmol·1-1) did not modify either glycogen synthase or glycogen phosphorylase activities. Insulin (porcine, 10-8 mol·1-1) in the medium significantly decreased total glycogen phosphorylase and glycogen phosphorylase a activities, but had no significant effect on glycogen synthase activities when compared to the controls (absence of insulin). In the presence of 10 mmol·1-1 glucose, insulin increased % glycogen synthase a and decreased % glycogen phosphorylase a activities in trout hepatocytes. Also, the effect of insulin on the activities of % glycogen synthase a and glycogen synthase a/glycogen phosphorylase a ratio were more pronounced at low than at high hepatocyte glycogen content. The results indicate that in trout hepatocytes both the glycogen synthetic and breakdown pathways are active concurrently in vitro and any subtle alterations in the phosphorylase to synthase ratio may determine the hepatic glycogen content. Insulin plays an important role in the regulation of glycogen metabolism in rainbow trout hepatocytes. The effect of insulin on hepatocyte glycogen content may be under the control of several factors, including plasma glucose concentration and hepatocyte glycogen content.